We are certified under ISO 9001. Maintaining the highest standards of quality is an essential pillar of VMT’s corporate policy. We therefore decided back in 2002 to obtain certification under the ISO 9001 standard and to keep up this certification in the form that is currently valid. We carry out a quality-based assessment and analysis of all sequences and processes in every phase of project handling for our customers. In this way, we can guarantee that our efforts to achieve outstanding quality are regularly reviewed and continuously improved. 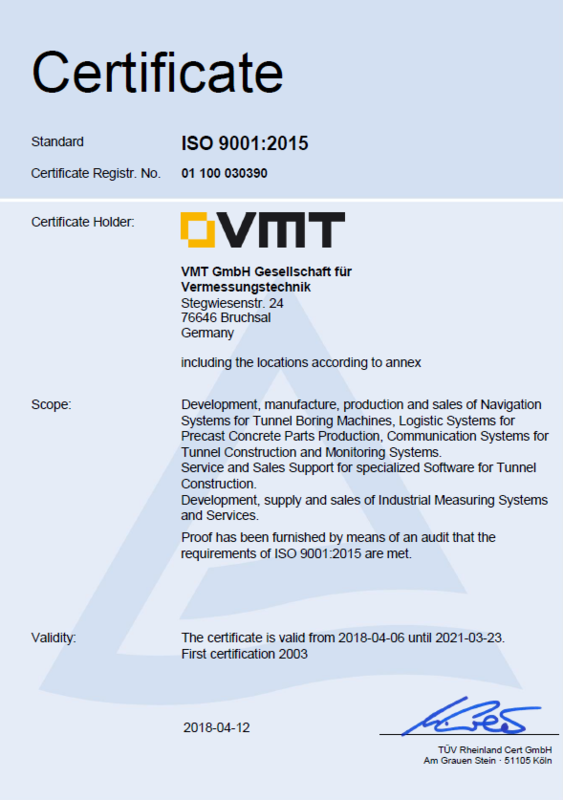 Implementing the quality policy laid down by VMT GmbH means that we focus even more on you, our partners and customers, and are able to guarantee and enhance customer satisfaction at the very highest level. We are always happy to answer any questions you may have about our quality management system.